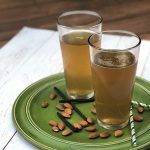 In a 16-ounce glass, stir together vinegar, vanilla extract, and almond extract. Add mineral water and stir. Add ice cubes, if desired, and serve. My favorite brand of sparkling mineral water is Gerolsteiner (affliate link).